Hardware such as bolts, nuts and washers are generally used for connections and fixtures. They form an integral part of the component structural integrity. Bolts are governed by standards such as ASTM and are typically stamped with an identifying marking on the head during the manufacturing process. The bolts selected for any application typically take into account the manner in which it is applied while taking into account the most prevalent mode of failure. It follows that it would be in the designer’s best interest to understand how bolts fail to avoid those situations. 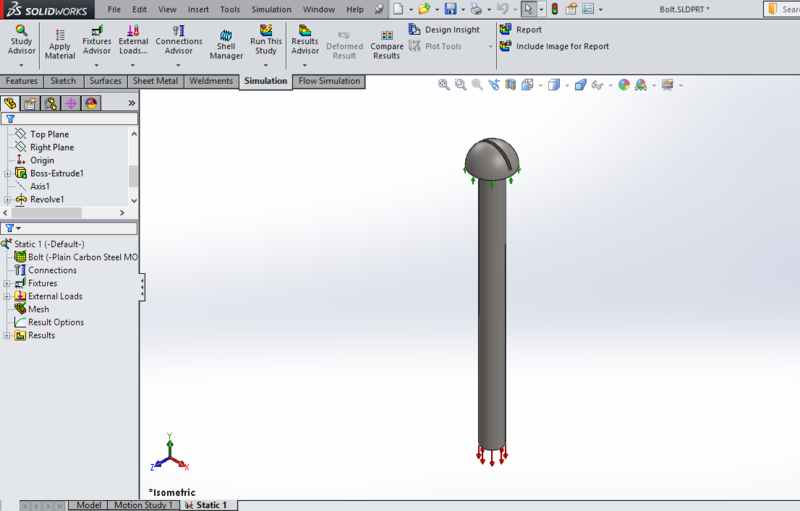 It is worth noting that the tensile strength for that grade of bolt is approximately 60,000 PSI. Therefore, using plain carbon steel as a template, the tensile strength was adjusted accordingly. 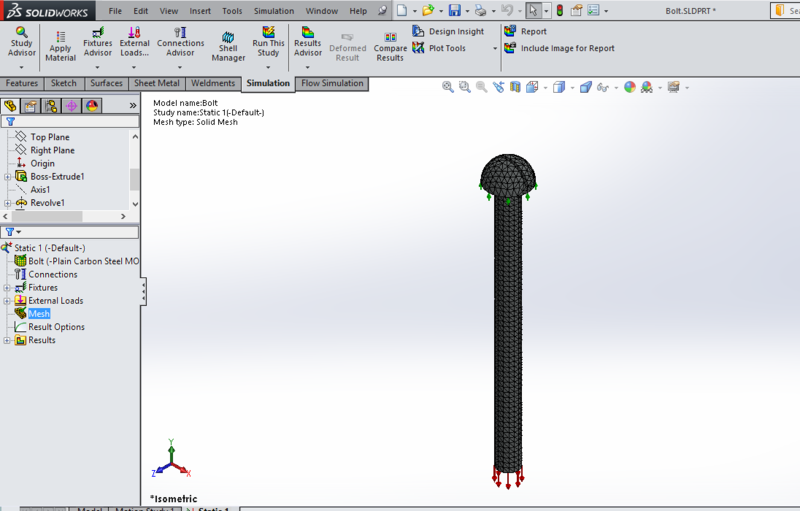 Next, we can set up a test scenario using SOLIDWORKS Simulation where the bolt is fixed at the top with a base tensile load of 10,000 PSI applied at the bottom. 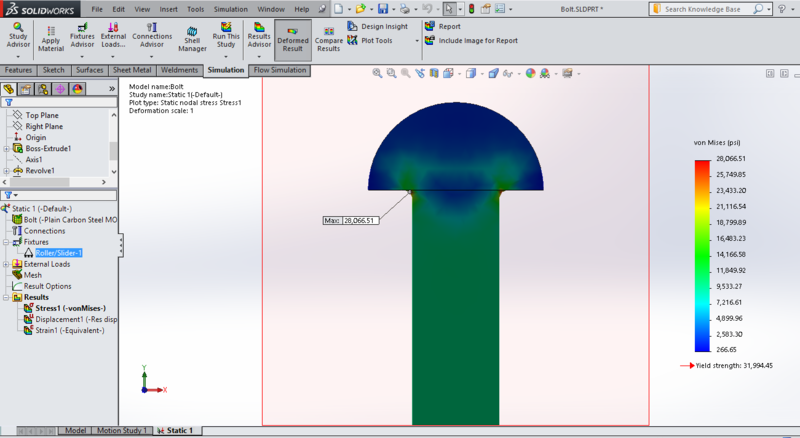 After running the Static analysis, we can do a section plot to understand how the stress are distributed in the cross section of the bolt. We find that the highest point of stress concentration occurs at the neck as expected with a value of 28,067 PSI. 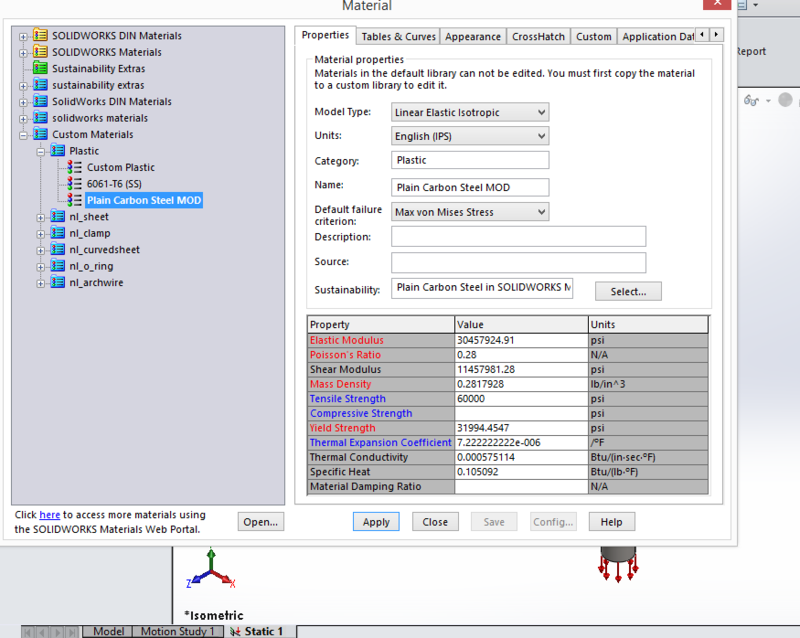 Note that this value is fairly close to yield strength of the material 31,994 PSI. If a stress value approaches the yield strength, the general assumption of linear behavior of the material begins to breakdown. Therefore it is in our best interest to run a non-linear analysis as well. Creating a new non-linear study and running a similar analysis we find that the actual stress is approximately 27,197 PSI.This value is less than the linear analysis but it is still close to yield. Given these results it would be in the designer’s best interest to either reduce the load, increase the bolt diameter, or chose a higher grade bolt. Sometimes bolt failure can occur due to other circumstances as well. Specifications such as how much a bolt must be tensioned at installation can make a difference. In other cases large batches can yield bolts with manufacturing defects which may fail below the yield stress. 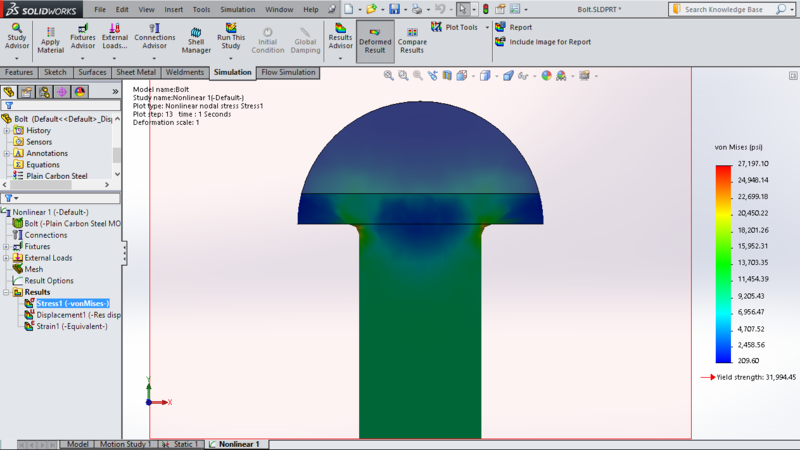 FEA Training Consultants Inc. is an authorized SolidWorks value added reseller specializing in SolidWorks 3D CAD design, SolidWorks Finite Element Analysis(FEA) and SolidWorks Fluid Flow (CFD) Analysis. 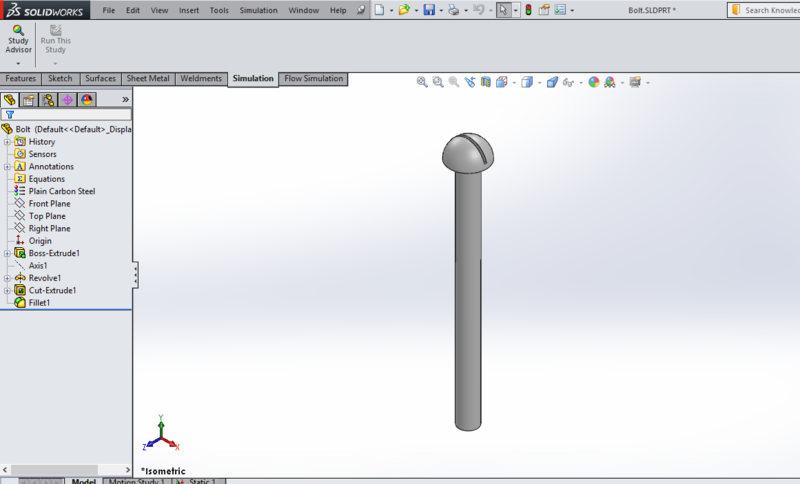 Our training and support for SolidWorksCAD design software is the BEST in its class. We are Ontario's leading VAR specializing in advanced SolidWorks Simulation (stress, thermal, vibration, dynamics, fluid flow analysis, etc. ).